With wood panelled walls, kauri doors and a corrugated iron ceiling you enjoy the ambience of the country with the facilities of the city. Why not treat yourself to a relaxing stay on our alpaca and rare breeds farm in the Red Barn nestled amongst our wonderful animals. A relaxing stay at Warwickz farm is only the beginning. Our farm tour which can take a whole morning brings you up close and personal with our breeds of mostly rare animals as you hear many delightful stories of farm life. 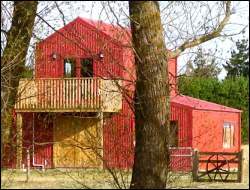 One wing of our custom built Red Barn is dedicated to Bed & Breakfast accommodation and designed to enhance your stay with all the conveniences of home blended with the flavour of the country. Our double bedroom with ensuite features a double brass bed, television, stereo system, dvd and dvd library, small refrigerator and sumptuous gowns to wrap up in. A ranch slider door opens out onto the rustic setting of pine trees and the wide expanse of the Canterbury Plains with the Southern Alps framing your view. Being separate from our farmhouse you can enjoy privacy and tranquillity, a perfect romantic stopover. 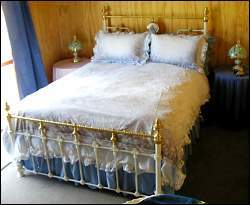 Bookings are essential and the cost is $155.00 per night including continental breakfast. This cost covers a farm and garden tour. Packages including full cooked breakfasts, barbeque meals, picnic hampers, scenic guided tours and longer stays can be arranged on application. An over night motor camper site is available with easy access to water for $15.00 per night (this does not include power or a farm and garden tour).